Do you have the passion and the creativity for fashion? Why not earn a living from it? The Freelance Fashion Designer's Handbook is your essential guide on how to go it alone, covering what to expect, making sure you get paid, planning your time, keeping up with your accounts, compiling technical packages for garments. It is your portable mentor, equipping you to work independently. Part 1 covers all the information to becoming a freelance designer such as creating a basic freelance contract, invoicing, how to find work, tax returns and much more. All supported with case studies. Part 2 contains the technical aspects of being a designer - including how to compile full technical packages for garments to be manufactured abroad. 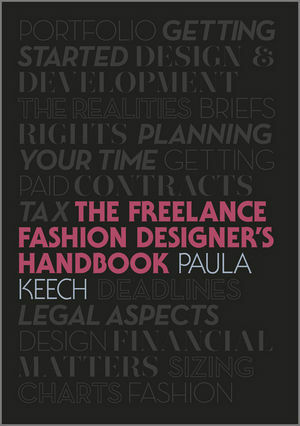 Paula Keech is a freelance fashion designer and part-time tutor at the University of Bedfordshire in Luton. Paula has worked in the fashion industry and has a wealth of experience to share. Income and expenditure templates have been created to help you balance the books. Time sheet templates are there to help you calculate time spent for each client. 'To fit' body measurements size chart templates have either a single grade or individual grades for each size to help with your design. Garment size charts templates can be used for women's, men's, girls', boys' and unisex garments. Increments and tolerances on the charts may be altered to suit individual requirements. These online resources have been created to help you run your business and allow you to focus on the thing you love the most; designing.